Tuesday, October 23rd is quickly approaching, and baseball fans eagerly await that special day. When the World Series kicks off on the 23rd, it will mean about a week of edge-of-your-seat games as the best teams in the country battle it out for the World Series 2018 title. And when it comes to watching the World Series with your closest friends and other baseball fans, then you need to make The Still your World Series headquarters. The Still isn’t like your average sports bar. This Las Vegas bar is a well-lit and spacious 8,000 feet, meaning even when it’s bustling during the World Series, you won’t feel overcrowded. This sports bar is designed just for the sports fan, and with 27 TVs there isn’t a bad seat in the house. You’ll be able to see every pitch, hit, and run and can cheer on your favorite team alongside other sports fans. Even the atmosphere at The Still is perfect for watching the game. Gather up your friends and family, then kick back and relax in a spacious booth, or stake your claim at the bar. Bud Bud’s, a refurbished Airstream trailer that was once abandoned in Tennessee, now serves as a fully functioning kitchen and makes for quite the centerpiece. 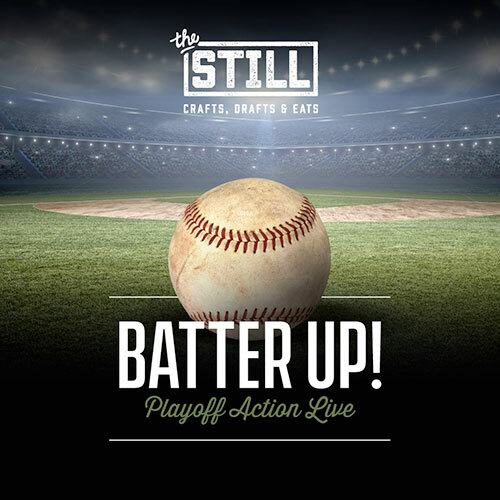 Modern, welcoming, and packed full of energy on game days, The Still is the go-to place for the World Series. No matter how long the game runs, we have plenty of choices to keep your party well-fed and satisfied the entire time. Our upscale bar food is delicious, and you can enjoy some unique twists on the classic game day food that you would eat at home. Our menu is loaded with choices. Our Crispy Style Chicken Wings make for a classic way to start off game day, and you can choose from a variety of sauces including our Signature Buffalo, Spicy Korean, Classic BBQ, Honey BBQ, and Arizona Ranch. Maybe a BBQ Chicken Quesadilla is more your style, or maybe you want to order Chips and Salsa or Guacamole for your entire group to share. When it comes to the main dish, you can’t go wrong with our Tacos. Our Chicken Street Tacos are a particular favorite, but you also can’t miss our Steak Street Tacos. As we do here at The Still, our Crispy Lobster Soft Tacos offer an upscale and unique take on bar food – you won’t find these unique dishes at any other Las Vegas bar! Our Crispy Lobster Soft Tacos feature a delectable blend of beer battered Maine lobster, cabbage, mango salsa, and sweet chili aioli. Looking for more traditional game day food? Our Mini Cheese Burgers are delicious and the perfect size for sharing. Or try our Prime Steak Tip Skewers, which feature housemade A1 butter. Our Philly Cheese Steak Panini is another popular choice, as is our Grilled Chicken Club Sandwich. If your team wins the World Series, you want to be able to celebrate accordingly, and The Still is the perfect place for that. Plus, we have plenty of options that will get you powered up for the game itself. Start the night off with our Fighting Irish mule to get into the mood, or maybe our Raging Bull signature cocktail is more to your taste. If things go south for your team, The Hail Mairy cocktail for two might be able to turn things around again. While our Signature Cocktails and other mixed drinks are delicious and memorable, we have some more reserved options on the menu, too. We have over 50 craft beers on the menu, as well as cider and wine. You’ll find some of your favorites on the menu, including Budweiser, Heineken, and Blue Moon Belgian White. Don’t forget that we offer both single beers, as well as a bucket of five beers, which can help to keep your party supplied through the game. Victory is sweet, so order a drink of your choice and top the night off with our Deep Fried Oreos or our Fried PB&J (featuring marshmallow crème and Nutella dipping sauce!). Either option will have you heading home satisfied and oh so happy. Want to witness history with delicious food, amazing drinks, and great company? Then The Still is the place to be. Don’t miss out on any of the action – be sure to make your baseball season reservations now.